In The Great Depression of 1994, we see a familiar face that has appeared in a previous episode. Remember Mournful Morris in 'If Money Be The Food Of Love, Play On? He's back in this episode, but plays a different character called Bryan, who acts as a depressed uncle of Ray's. It is clear that this episode is the least favourite of all Minder episodes with pretty much not a lot happening throughout. What can we find which is good about it? Anything at all? The depressed man plotline limps on for about 30 mins to a poor conclusion. Then, suddenly, we're amongst the beer barrels in the backyard of the Winchester dealing with an ex-policeman dealing with dementia!? It's like two stories glued together....and not too well. We don't even see Ray's mum, do we? And yet she's the cause of the 'depression'? Very odd. I guess the theme is mental health. A serious subject, not handled too well here, unfortunately. Agree with the general opinion that this was a very, very strange Minder episode - and yes maybe if we had seen Ray's Mum and her 'ideas' - but the entire episode just seemed very disjointed. And maybe it's the female in me, but I actually found it a little emotional towards the end with Henry Keys - the best parts of this episode was Arthur and Ray trying to get to grips with 'Depression' from a library book (bi-molar), and Arthur back to normal in the last 20 seconds of the episode. Loved the scenes shot in the cemetery, the back drop of the head stones and the falling snow!! Even a guest cameo from respected stage actor Robert Stephens can't lift this one. He's not given much of a role and he looks quite ill which only adds to the general despondency. Rather a sad contrast to his sly and witty intelligence chief in Gangsters. Think he died about a year later? The series had almost ground to a halt by this stage hadn't it? I also think it's the worst episode. I never watch it on DVD. 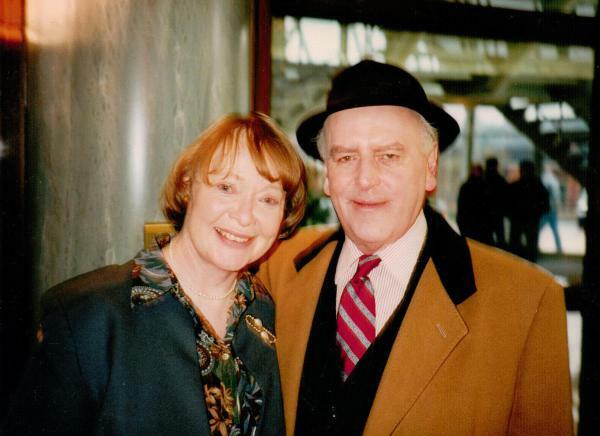 I think the final series had some superb episodes in there and these are some of my absolute favourite Ray episodes: Another Case Of Van Blank, One Flew Over The Parents' Nest, The Immaculate Contraption, All Quiet On The West End Front, On The Autofront and Bring Me The Head Of Arthur Daley. I really don't know how this episode got approved. Sure, it's nice to see Arthur, Ray & Dave doing their thing but apart from a few nice locations and the few things mentioned here - most notably the picturesque snow at the cemetery, this has nothing to offer which is a real shame. "Here Arthur what was his famous catchphrase?" "Let us take you to the dry cleaners. Way ahead of his time." 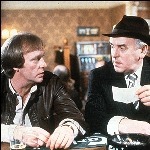 No matter now much people say this was the worst episode of Minder, in my opinion there wasn't one episode that was bad. George Cole was an absolute joy to watch and he would never have agreed to star in anything if he didn't think it was worthwhile. Rest easy GC, your legacy lives on. Whilst not the greatest episode ever made, I quite liked this, I know I am in the minority of one! Just a nice subtle episode, a little different from other episodes where we see another side of Arthur. I thought the scene with the ex cop Henry Keyes, who bought the car off him and then find him in the Winchester a little lost was a little moving, not enough to stop Arthur from fleecing him, but moving from an Arthur point of view. As posted above, even a poor script does not stop the star of George Cole shining brightly throughout. I have to say I preferred this to the previous episode! I agree that this one is strange as it looks like it has ended, then has the odd depressed policeman scene at the end. But it is still watchable for the Ray years Minder atmosphere. A poor episode with a totally forgetable plot. Seems to me like some wizz thought of the title first then worked backwards to the plot and storyline. As far as I can see writer ( Arthur Ellis ) only wrote this one episode - so maybe it can be excused as a first effort. 1/5 for sure. After three strong episodes the faults in this one really stand out. It feels like it loses it's way before it thankfully ends. The plot (?) is a mess and meanders. It feels like it was being made up as they went along. Depression and mental health are serious issues and hardly topics for an episode of a series like Minder. It is well acted which is impressive because the script is terrible. That kept me from voting it as Rubbish. Even George Cole can't save this fiasco. Arthur's line about mail order syrups did make me laugh. I only recently realised James Warrior (D.S. Rogerson) was D.C. Jellyneck in The Sweeney! Just finished my Terry box-set and I'm considering dipping my toe into the (fanfare) 'Ray Years'! There are quite a few on YouTube SO! Can anyone recommend the best episodes to watch? I would certainly give the first RD episode a view firstly, see how it sets Ray up as the new 'Minder'. There are a few weak episodes, but overall the series is very good with some episodes more than holding their own against anything in the Terry years, the next RD series is top notch stuff. Just watch it with an open mind and enjoy. The second RD series would be my favourite. This particular episode is certainly not representative of how good the Ray years could be. I dunno, I watched this one again recently and I think that there's a few good lines in it. I like the way that Brian clears out the Winchester quicker than Dave's lasagne and we learn that Arthur can't con honest people plus Dave wearing the toupee raises a smile but it doesn't wrap up well and leaves you feeling depressed. This is probably one of my least favourite episodes as it seems so sombre and poignant (hence the title). By coincidence, I was personally going through a very bad patch at the time of this episode's original airdate (at the age of 16 and 3/4) with severe anxiety and depression, but have thankfully long since recovered!! Anyone notice the 'chicken tiles' from the 70s era on the walls of the bathroom where the depressed bloke locks himself into ? I have always found those creepy and sinister from a very young child, as we had those in our bathroom!! I like the snowy cemetery scenes and Peter Jones cameo keeps your attention.Probably the weakest episode from the last season but even this isn't that bad. I think is by far and away the most disappointing episode of 'Minder'. As others have said, nothing really happens. For me, it was a relief when the end credits rolled. I have only seen this once since it aired and TBH I'm not in a hurry to watch it again. I was expecting alot at the end but I was let down by it. Tried to keep the humour with Ray stealing the giant book and not sure if I can laugh at Arthur not giving back the money towards the end. Yeah, he died in 1995. The episode might of worked as a stand alone educational spin-off like ‘A Little Give and Take.’ I think the budget for Series 10 was cut, this feels like a filler episode. If the producers knew for definite the series was finishing, they weren’t trying to go out with a bang.